Spring 1915, Dublin. Katie Crilly gets the news she dreaded: her beloved twin brother, Liam, has been killed on the Western Front. A year later, when her home city of Dublin is suddenly engulfed in violence, Katie finds herself torn by conflicting emotions. Taking refuge in the home of friends, she meets Hubie Wilson, a comrade of Liam’s from the Front. As the world Katie knows is turned upside down by insurrection, previously unimaginable things suddenly seem possible. Lia Mills is the author of three novels, Another Alice, Nothing Simple and Fallen as well as a memoir, In Your Face. Her first novel, Another Alice (1996) was nominated for the Irish Times Irish Fiction prize. Her second novel Nothing Simple (2005) was shortlisted for the Irish Novel of the Year at the inaugural Irish Book Awards. In Your Face (2007), a memoir of her diagnosis of, and treatment for oral cancer, was named as a favourite book of 2007 by several commentators. 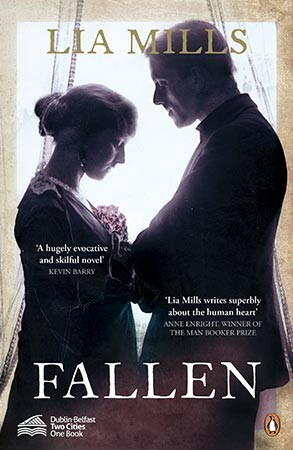 Her third novel, Fallen, is set in Dublin 1914-1916.